Welcome to Cornwallis Veterinarians! Your local veterinarian in the Annapolis Valley. We’re proud to provide a wide variety of veterinary medical services for small and large animals in the Annapolis Valley & surrounding areas! More than 60 years of service and care! 1952 – 1955, Dr. Duncan Smith and Dr. Emerson North used the basement of Dr. North’s house on Belcher Street, Kentville, NS, as their office location. Being veterinarians in this agricultural region, they practiced veterinary medicine mostly from their vehicles as they traveled from farm to farm. Dr. Smith, Dr North and their newest veterinarian, Dr Wes Trenholm, formed a partnership and called it Cornwallis Veterinarians Ltd. The Certificate of Incorporation is dated the 27th day of September, 1956. It was unique at the time to see three veterinarians enter into a practice together as most veterinarians practiced individually. They moved the office out of Dr. North’s basement to a dedicated building on Belcher St. In 1970, Dr. Don Hancock joined the partnership. 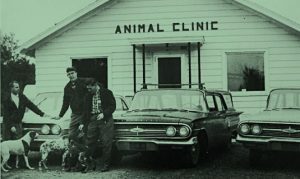 The practice of Companion Animal medicine, under the care of Dr. North, became a larger part of the practice, so in 1976 they moved again into a larger and newly equiped hospital at 273 Belcher Street. The practice remains at this site in Kentville and has seen a further expansion and renovations over the ensuing years. The smaller clinic in Three Mile Plains, Hants County, NS, was opened in 1982. Today, there continues to be seven veterinarians serving farm animals and horses in the Annapolis Valley and beyond. The companion animal practice has grown to nine veterinarians, two locations and a support staff of trained and compassionate individuals.